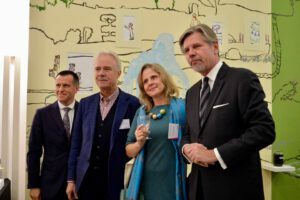 Sir Jonathan Mills reminded the guests during the Award Ceremony at BOZAR on 18 September of the enriching impact of arts activities on our society and their powerful message towards European integration. Bernard Foccroulle, composer, musician and director of Festival d’Aix-en-Provence, joined the conversation saying how important it is to show the commitment of European arts festivals to the dialogue between different artists, cultures, traditional and contemporary repertoire, popular and more elitist programming – and to see a reflection of this diversity in Europe’s online Arts Festivals Calendar. The EFFE International Jury members are: Sir Jonathan Mills (Chairman, EFFE International Jury – Australia, UK), Tamar Brüggeman (Co-Director, Wonderfeel – Netherlands), Peter Florence (Director, Hay Festivals – UK), Keng Sen Ong (Director, Singapore International Festival of Arts – Singapore), Haris Pašović (Theater director, Director East West Centre, Sarajevo – Bosnia and Herzegovina), Pawel Potoroczyn (CEO of University SWPS in Warsaw – Poland), Renato Quaglia (General Manager, FOQUS Foundation – Italy), Irene Rossi (Couleur Café – Belgium), Fruzsina Szép (Director, Lollapalooza Berlin and Board member, Yourope – Hungary). More information can be found at www.efa-aef.eu and www.effe.eu. 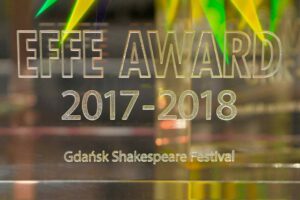 This entry was posted in News and tagged EFFE AWARD, EFFE Label, gdańsk shakespeare theatre, The Gdańsk Shakespeare Festival. Bookmark the permalink.